The Courtiers’ Anatomists is about dead bodies and live animals in Louis XIV’s Paris--and the surprising links between them. Examining the practice of seventeenth-century anatomy, Anita Guerrini reveals how anatomy and natural history were connected through animal dissection and vivisection. Driven by an insatiable curiosity, Parisian scientists, with the support of the king, dissected hundreds of animals from the royal menageries and the streets of Paris. Guerrini is the first to tell the story of Joseph-Guichard Duverney, who performed violent, riot-inducing dissections of both animal and human bodies before the king at Versailles and in front of hundreds of spectators at the King’s Garden in Paris. At the Paris Academy of Sciences, meanwhile, Claude Perrault, with the help of Duverney’s dissections, edited two folios in the 1670s filled with lavish illustrations by court artists of exotic royal animals. Through the stories of Duverney and Perrault, as well as those of Marin Cureau de la Chambre, Jean Pecquet, and Louis Gayant, The Courtiers’ Anatomists explores the relationships between empiricism and theory, human and animal, as well as the origins of the natural history museum and the relationship between science and other cultural activities, including art, music, and literature. "In Guerrini's hands, the history of science and medicine in early modern Paris was simultaneously a history of fairy tales and opera, dogs and chameleons, artists and knife-makers, labyrinth-making and oratory. It is a fascinating book that is a must-read for historians of anatomy and of early modern science and medicine, and will be accessible and gripping for readers well beyond those fields." "The early science of living creatures developed along lines quite different from those of astronomy, physics, and chemistry. Guerrini describes how the study of animals grew and developed in 17th-century Paris. According to the author, dissection “has a justifiable claim to be the most widespread and significant scientific activity” of the century, and Paris became the center for the dissection of animals of all sorts—from humans to ostriches and even an elephant. Focusing principally on the remarkably diverse and numerous dissections performed by Joseph-Guichard Duverney and on the subsequent emergence of Claude Perrault’s lavishly illustrated Histoire des animaux, Guerrini outlines the many ways in which patronage, humanistic scholarship, art, experimentation, and new theories of mechanical science interacted in fruitful ways to advance the study of animal life. The text is clearly written and thoughtfully illustrated and includes over 60 pages of notes and bibliography. Recommended." "This work is original in its documentation as much as in its form and content....Its historical breadth is unprecedented insofar as its topic is that of 'animals and humans' in Grand Siècle Paris. In Guerrini’s book we find...to borrow from Louis-Sebastien Mercier, the Tableau de Paris of the Grand Siècle. Guerrini crosses practices with events, rather than crossing disciplines. Without a doubt, the results exceed her expectations." "Guerrini ably shows how anatomy emerged as a science within the institutional and courtly spaces of Louis XIV’s France. Her beautifully illustrated and richly woven account explores the relationship between the emerging fashion for dissection and the mechanical philosophy, showing how and why dead bodies were enrolled into the wider transformation of European learning in the seventeenth century. Navigating between the pan-European Republic of Letters which made and disseminated new anatomical knowledge, and the promise and constraints of courtly patronage, Guerrini displays an assured grasp of her subject." "Guerrini’s research has uncovered a wealth of information on the key figures of the time and their endeavors, from the early contacts among Jean Pecquet, Adrien Auzout, and Blaise Pascal, to the lecturing style of Joseph-Guichard Duverney. The Courtiers’ Anatomists provides by far the most detailed account of the French anatomists’ researches, relying on a subtle and far-reaching analysis of extensive manuscript sources ranging from the reports of the French Académie to Duverney’s handwritten notes." "The history of seventeenth-century French science has suffered considerable neglect. Both the richness and the complexity of Guerrini’s The Courtiers’ Anatomists suggest why this is so: the context she explores requires both a mastery of the intellectual tradition throughout history and a deep familiarity with the sciences and scientific practices across Europe. Guerrini deftly weaves a complex history of many interconnected traditions, grounded in French professional and familial networks, court practices, and patronage. Thoroughly incorporating the natural sciences into the Scientific Revolution, The Courtiers’ Anatomists offers an important amplification of our understanding of scientific practices in the early modern period." 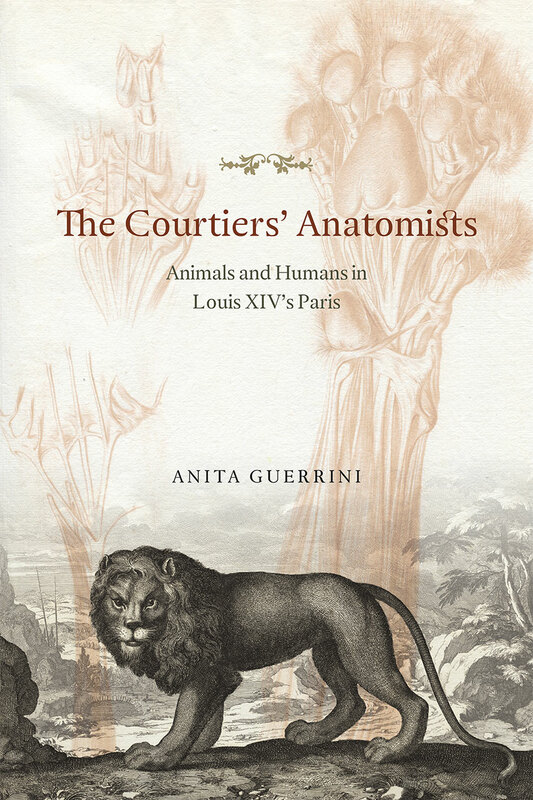 "The Courtiers’ Anatomists is a welcome addition to the history of science and medicine, and to the history of the age of Louis XIV...Guerrini adds a new twist to our understanding of the political culture of Old Regime France by enriching Sharon Kettering’s classic conception of patronage, and by articulating a nuanced role for animals in the broader propaganda process..."